A Regional Baseline Study for South Asia is being conducted with the aim to engage relevant stakeholders in advocating for equal rights for women in South Asian countries. The Regional Baseline Study will specifically advocate for adoption of gender-sensitive guidelines in media and policy directives by the participating countries, viz. India, Nepal, Bangladesh, Pakistan, Maldives, Afghanistan, Sri Lanka, Myanmar, and Bhutan. Based on data and information gathered by each of these nine (9) countries in the South Asian region, the study would advocate for an evidence-based action-plan to be taken up in bringing changes on the ground and in policy formulation. 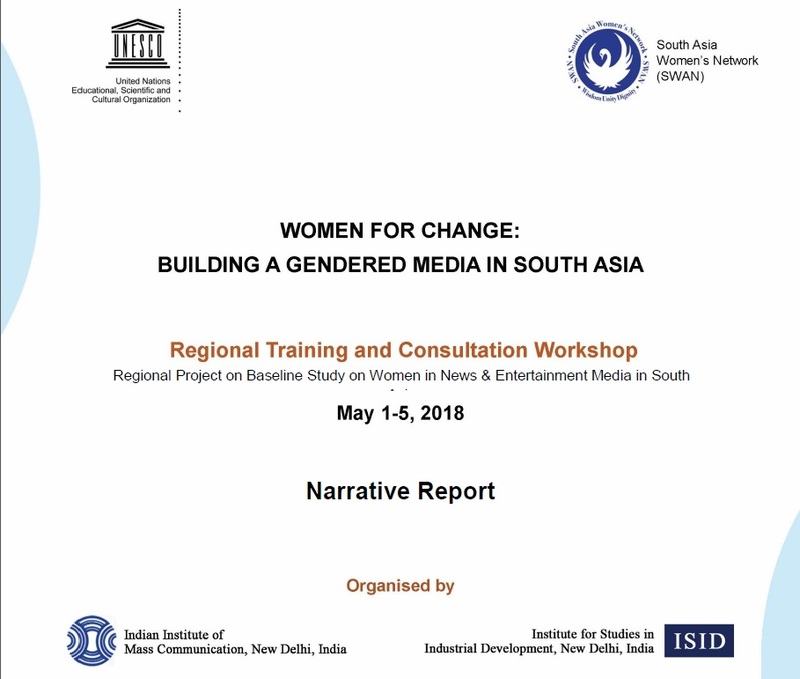 The Baseline Study aims to assess the status of women in media in South Asia and portrayal of women issues, thereby providing the basis for monitoring, together with the drawing a roadmap for measuring annual progress and achievements, combined with advocacy strategies. Indian Institute of Mass Communication (IIMC), New Delhi and Institute for studies in Industrial development (ISID) organized a 5-day capacity building workshop for researchers and working journalist from nine participating countries. The training workshop focused on two broad areas. The residential workshop was conducted at the ISID campus, New Delhi. Impart skill sets of the study to partners to align their research efforts with the Objectives of the Baseline Study Project. To revisit the research activities involved in conducting primary field-research of the Baseline study by the participating countries. To discuss and share the time line for completion of each research phase of the Base line study. The workshop was designed as a hands-on capacity building and training workshop, which included interactive training sessions and sessions on preparing research material that, eventually could serve as a ready reference for research teams as they conduct their Primary research. The organizers briefed the teams from the participating countries on the Objectives of the Baseline Study Project and the Research Methodology as illustrated in the Project’s research design. The group of 24 participants represented the core teams of the seven participating countries of Afghanistan, Bhutan, Bangladesh, Myanmar, Nepal, Pakistan, Maldives, Sri Lanka and India. 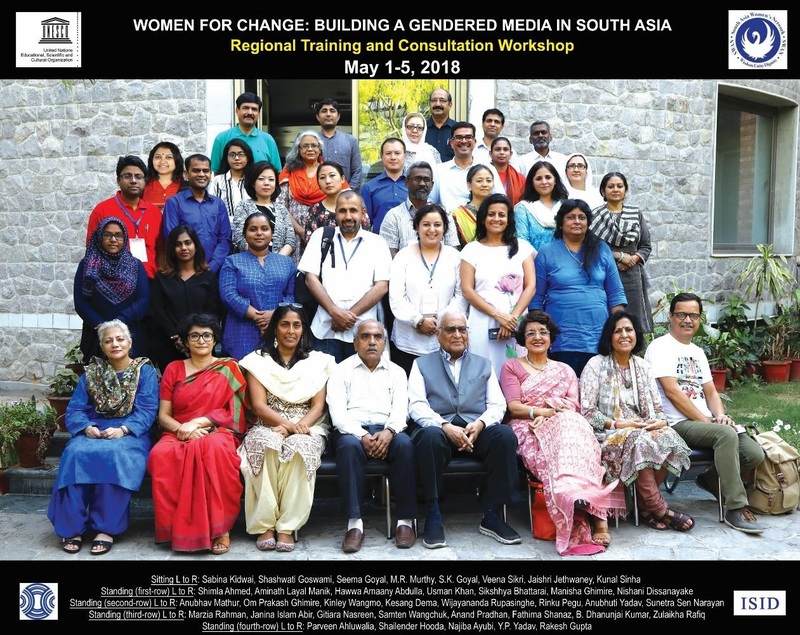 The participants included academicians and the members of the editorial teams appointed for the Report on the Status of Women in Media in South Asia. Import/ Export of data using Ms Excel and SPSS. Preparation of structured and semi structured questionnaires and how to modify them. Qualitative and quantitative research methods and tools in conducting content analysis of print media, TV, advertisements and Visuals across print, electronic and digital media. Sampling design, sampling techniques and sample size selection for survey, Focus group Discussions (FGDs) and In-depth Interviews (IDIs). The Participants comprised a heterogeneous group with varying background in terms of the country they represent, work profiles, varying years of experience at work. The training sessions provided space to the participants to seek answers to their queries, which helped them to understand how they would utilize the newly acquired research knowledge and skills towards completion of research activities to match the media landscape and peculiarities in their respective country. The workshop began with welcome note by Prof. M.R. Murthy, Director, ISID. Prof. Murthy congratulated everyone for being a part of this international project and expressed his happiness that ISID is a part of this baseline study. He added that the purpose of this workshop is to expose the participants to the standards of the survey and the idea of this capacity building workshop is to equip the participants so that they are able to quantify the status of “Women in Media” in their country. He also assured that ISID would extend all possible help to make this project a success. Prof. S.K. Goyal, Vice Chairman, told a bit about the history of ISID and shared his vision of ISID. He welcomed the delegates from different countries and added that this special day also happens to be the foundation day of ISID. Prof. S.K. Goyal added that ISID was established with the primary idea of doing research and this project under the Media division will give a new dimension to the Institute. He wished the participants and this project a success. The Chief Guest Mr. Al Amin Yusuph Advisor, Communication, UNESCO delivered the inaugural address and encouraged participants to bring out their best by doing path breaking research. He appreciated the idea of forming gender sensitive guidelines and advocated equal rights for women. He added that the objectives of the “Women in Media” project are in line with the objectives of UNESCO and its mandate. Mr Al Amin highlighted the fact that there is gender inequality in South Asia and women remain unrepresented in South Asia. They are also portrayed in a stereotypical manner, which promotes inequality. According to Mr. Amin, most of the interventions of UNESCO are guided by the Gender sensitive indicator for the media (GSIM). He thanked SWAN and its members for collaborating and drew attention to the ultimate aim towards formalizing the South Asian Regional Protocol in Gender and Media. He looked forward to research finding on the status of women in media, which will facilitate formulation of a customized policy by each country to achieve proper standards and good work culture. Mr. Al Amin concluded by underlying the objective of UNESCO of changing behavior in the community through the media. SWAN Chairperson & Convener Prof. Veena Sikri provided the background of the whole project. She briefed about the initial work done since the inception of the project and future plan of activities. 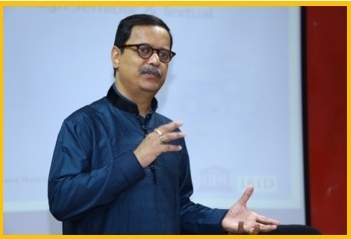 Prof. Veena praised IIMC and ISID for their collaborative efforts in planning and executing the baseline survey and felt confident that the outcome of this project would bring tangible results and will equip the participants to do a better job in their respective countries. Prof. Veena emphasized upon the need for changing the mindset with the help of media. She referred to the Kathmandu meet, held in November 2017, where plan for Secondary research to be done by participating countries was finalized. Prof. Sikri also questioned the role of media institutes and the curriculum, which is taught at various Institutes. She raised the concern, if the existing course syllabus adequately covers the emerging and important topics and issues of gender sensitivity and in a manner that it imbibes the necessary knowledge and sensitization towards issues of working women in general and women working in media establishments in specific. She thanked ISID, IIMC and UNESCO for giving their unflinching support to make this project a reality. Prof. Gita Bamezai, Head of the Communications Research Department at IIMC briefed about the Institute and highlighted the need for training workshops to enhance the research skills of the working journalists and researchers to carry out such base line studies. Prof. Bamezai elaborated on the objectives and the expected learning outcomes of the training sessions. She said that in past several studies on portrayal of women in media and their treatment have been done but they mostly cater to western parameters whereas this study is more about development as it will address the issues from a non-western perspective. Prof. Gita also mentioned that lot of commodification of content is taking place and women are becoming a means to drive their consumption pattern. She explained that this study will examine; i) news content and entertainment which tends to push the whole agenda that women need to be looked as an object, ii) how policies, guidelines and the law prevail within the media industry circumscribe in making women equal partners in content creation, and iii) how journalist and media practitioners look at gender, since very little is covered about gender sensitivity at media schools. She emphasized upon using a mixed methods research approach to do baseline studies. Prof. J. Jethwaney, Media & Communication Division, ISID explained the need for training workshop and emphasized that the purpose of the workshop is to enable the participants to look through the same prism. She briefed the participants to the need for survey to study why and how the advertising industry needs to be studied on the issue to portrayal of women. Based on the secondary data brought by the participating country representatives, and with guidance from ISID, the advertising survey will be designed to look at the working conditions of the women in the advertising sector. She suggested the use of FGD for understanding the process of ad creation and laid importance on upon team spirit to accomplish the objectives. Prof. Seema Goyal introduced the idea of Gender Sensitivity Barometer (GSB) and the multimedia based tool kit and the self-assessment online test, which can be utilized to achieve the desired data. Prof. Seema suggested the development of software and the mobile application as one of the end products of the study. with all stakeholders. He added that contemporary research tends to focus a lot on metros; instead, focus should be on small towns, villages and sub urban areas. How many women are working in small places at the district level, their conditions and plight? He also questioned the role of media organizations at both national and regional level and added that women were given softer stories to cover, whereas a women journalist may give a new perspective to the same story to make it interesting. He considered that this project was important since more and more women were joining English journalism and advertising courses. 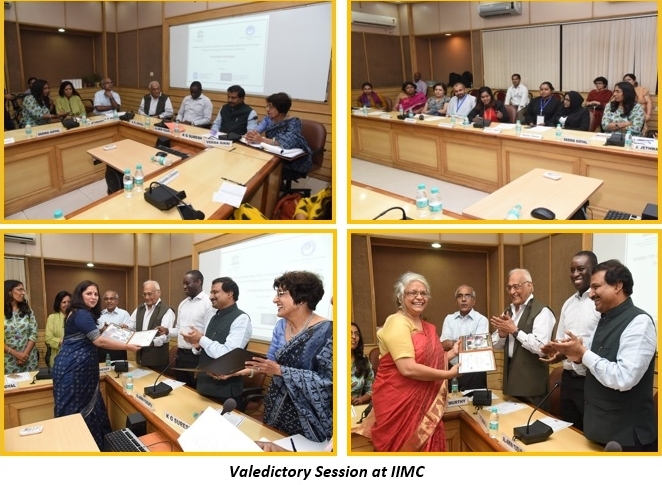 He added that IIMC has been working with international organizations like UNESCO, UNICEF, REUTERS Foundation, Oxford University in various capacities and in different programs. Shri Suresh concluded by saying that, media organizations should be taken on board in order to bring the desired change. He also felt that editors and owners should be included as without them it would not be easy to formulate gender guidelines and improve working conditions of women in media. Prof. Seema Goyal, thanked the chief guest and other dignitaries for their presence and encouraging words. She thanked Prof. Veena, Prof. Jethwaney, Prof. Gita Bamezai, Prof. Murthy and Prof. S.K. Goyal for their support and presence. She acknowledged support from UNESCO for funding this project. She also thanked the representatives from different countries for their participation. Shri K.G. Suresh and Prof. Veena were greeted and presented a memento by Prof. Murthy. Prof. Seema introduced and thanked the administrative and technical staff of ISID to their support and help. At the end, the participants introduced themselves and briefly mentioned about their expectations from the workshop. The training workshop commenced with the country wise presentations of the secondary research. They presented data on the number of women working in the electronic, print media and advertising sector in their respective country. They also mentioned the gender policies and guidelines they have in media organizations. Apart from this distribution of geographic location-wise, concentration of media organizations, ownership, ratio of male and female employees and number of media training Institutes was also provided by the participating organizations. There was however, a lot that most country teams have to further do to make the secondary data more robust. Session 1: The first session started with the discussion on Epistemological Perspectives in conducting a research study. Prof. Gita Bamezai deliberated on the research design by explaining the epistemological perspectives in understanding and probing the portrayal and representation of women in media. She also briefly spoke about the gendered relations of power. She elaborated on the need for adopting mixed methods approach and how such approach will be useful to study the portrayal of women in media. Session 2: The joint session by Prof. Gita Bamezai and Dr Anubhav Mathur talked about survey as a research tool. The questionnaire for the “Women in Media” was discussed with the participants and queries raised by them were answered. Each team was given a copy of the survey. They were asked to read it and clarify the doubts regarding the questions, responses, levels of measurement, language, ambiguity etc. The objective of this exercise was to help the participants to learn to modify the instrument according to their county specific requirements. ISID team shared questions on the advertising part that would be included in the consumer survey. Session3: Dr Anubhav Mathur introduced the participants to online tools for conducting surveys like Qualtrics and google forms. Ms Shashi Chhetri (Data Analyst, DECORE, IIMC) demonstrated the use of Google forms to the participants. The participants learnt the utility of Google Document, how to use Google forms and how to import data to Microsoft Excel. Session 4: The post lunch session familiarized the participants with SPSS (Statistical Package for Social Sciences). Dr Anubhav Mathur explained use of SPSS for analyzing the data which will be collected during the survey. The participants underwent hand-on training on basic statistics and some tests of inference. The concepts of variables and levels of measurement were also discussed. The participants learnt the processes of coding and data entry using SPSS. Simple tests of significance, Visualization of data and interpretation of results were also told to the participants. Session 5: Prof. Gita and Dr Anubhav elaborated about the research instrument to be used for the media consumer survey. The team of participants from each country worked in groups to identify and evolve the ways to improve the instrument. The resource persons cleared their doubts and queries regarding improvisation of the instrument. Different types of questions in the research instrument (questionnaire) were discussed separately along with their levels of measurement. This enabled the participants to learn to frame questions in order to elicit the desired response on perceptions and views. In the concluding session the sampling method and design was discussed by Dr Anubhav Mathur for conducting survey with the consumers of Media. Out of many sampling techniques, Simple random sampling method and strata were introduced to the participants. Strata based sampling strategy on the basis of circulation of print media and Television viewership was also demonstrated by Dr. Mathur to the participants. This session also dealt with the calculation of sample size for the survey by use of formula and online assistance for sample size calculation. Dr Anubhav demonstrated the use of online calculators to calculate the sample for a survey when the population is known. Session 1: The day initiated with discussion on Qualitative Research methods. Prof. Pradeep Krishnatray familiarized the participants with Content analysis as a potential research method to study the portrayal of woman, both quantitatively and qualitatively. He engaged the participants in an exercise to build know-how of the steps and procedure involved in doing content analysis . He further acquainted them with the sampling techniques used for sample selection for content analysis by taking example from print media. Session 2: Dr Anubhav Mathur discussed the quantitative approach of content analysis. A code sheet for doing content analysis for print media especially newspapers was shared with the participants. He further suggested the sampling design which could be adopted for selecting newspapers for conducting the content analysis. Discussion regarding the sampling unit, time period and sample size also took place. He explained how the data entered with the help of Code sheets will be analyzed by use of SPSS. 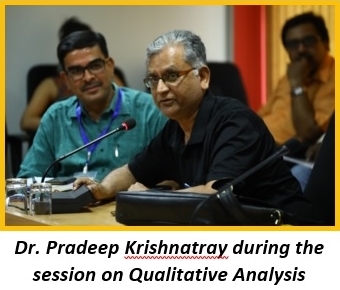 Session 1: In continuation with second days, Prof. Pradeep Krishnatray explained the qualitative methods to analyze the content in the visual media. A small exercise with participants was done to demonstrate the process of coding of various parameters in the visuals in print media. Prof. Pradeep also shared the code sheet for the content analysis of visuals. A hand-on exercise to demonstrate the use of Atlas.ti, software for qualitative content analysis was conducted by Mr. Angshuman of CCCI, John Hopkins India. He explained the use of Atlas.ti by taking content from print and electronic media. Session 2: Taking into cognizance the popularity of digital media among users in all age categories, content analysis of content in digital /social media becomes pertinent. Dr Vinti Agarwal gave an overview of methodology required to generate sample for content analysis of digital media content and also spoke on different methods of conducting CA. She also explained the research methodology involved in doing analysis. A practical exercise with participants demonstrated the concept of sentiment analysis using MS Excel. Session 3: Dr Sabina Kidwai from MCRC, JMI provided overview of the thematic analysis to understand the representation and projection of women in Indian Cinema. Citing examples from Indian films she discussed the transition in the ways women have been portrayed in Indian cinema. Including the manner Indian women are being presented in negative stereotype style. She also mentioned about the sampling strategy and the selection of units for content analysis of films. 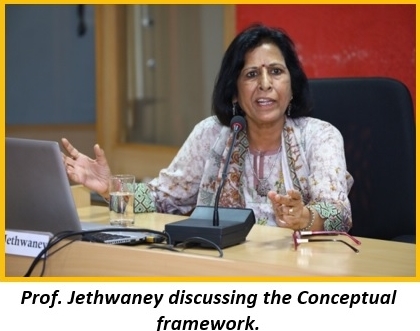 Prof. Jethwaney discussing the Conceptual framework. 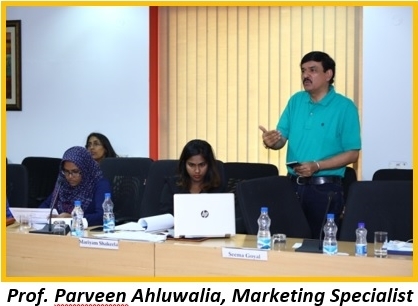 Session 4: Dr. J Jethwaney took the participants through several decades of advertising narrative by sharing the issues taken up during the feminist movement in the 1960s to various other theories and paradigms that emerged in the last over seven decades. Portrayal in the advertising space was not necessarily the reflection of the existing culture, but was often driven by the commercial demand that made creative teams to either reinforce or create stereotypes and objectify women to draw eyeballs. Delineating the research trajectory, she shared that it was for this reason that two timelines were being suggested for looking at advertisements, from 2001-2010 and 2011 onwards. This would map the changes if any in portrayal of women for better or worse across select brand categories that included Lifestyle, FMCG products, automobiles, Travel and leisure and Banking and Insurance. So me scholars, she shared were of the opinion that Western advertising agencies and multinational corporations that entered the South Asian markets in the last two decades or so have influenced local advertising in these markets. As one of the significant medium that reflects socio-cultural values, advertising represented these trends as well. Goffman’s typology set in the US cultural milieu, she said needed to be seen from that perspective and wherever it did not match the local cultural practice of a particular country, it needs to be reflected in the discussion by teams in various countries. Session 5: The session was jointly taken by Mr. Parveen Ahluwalia and Dr. Shailendra Hooda. Mr. Ahl uwalia gave the rationale for choosing certain categories of brands for ad content analysis which were likely to portray women stereotypically or in inappropriate manner. Of the five categories selected, viz., FMCG, Lifestyle, automobile including two wheeler and tyres Travel & leisure and Banking and Insurance, broad sub-categories were shared with the participants and they were asked to be free to select at least three campaigns per sub-category from among five brand categories, making a minimum of 15 campaigns into 1-5 ads per selected campaign across press, electronic and digital media. The time line decided was two decades, viz., 2001-2010 and the current decade 2011- to date. This would provide insights on the trends and perceptible changes, if any in these timelines. Dr. Shailendra Hooda had worked on the sample formula for India, which was discussed with the participants. The sample population for qualitative research was finalized for all the countries, keeping in view the size of the advertising industry in various countries with the statistical formula. An advisory on the sampling plan vis-à-vis all participating countries was prepared during the session. Session 1: In this session, Mr. Kunal Sinha explained how ads would be content-analysed, based on Erving Goffman’s typology from his landmark work: Gender Advertisements (1976). Mr. Sinha in the context of advertisements said that most of the selling was indeed based on role modelling. The cycle of feedback in his view has been shortened thanks to the proliferation of digital media and social networking sites. The content therefore has to be democratic. Qualitative research he said was all about mapping beliefs and opinions. In Advertising, the Stimulus-Response theory is often referred, to explain how it works. The stimulus-Response analogy is used for advertising, the stimulus being the persuasive message inciting the reader/viewer to respond by buying the brand. In the world of semiotics, an ad is treated as a sign, a cultural understanding of the stimulus (a piece of information/communication). Semiotics in other words is a science that studies life of signs and texts. Mr. Sinha shared many examples on how to deconstruct the ads based on Erving Goffman’s typology. Since the research was undertaken four decades ago, and was set in the context of the American culture, there could be issues vis-à-vis the South Asian culture, therefore while analyzing the ads on Goffman’s typology, he advised the researchers to feel free to bring cultural norms and contradictions in their country specific narrative. Session 2: During the practical session, Mr Kunal Sinha demonstrated how to prepare the code sheet for analysis of advertisements and also facilitated the participants to understand the interpretation of data. The hands-on exercise helped the participants to do coding for the TV advertisements shown in media in their respective countries. Participants got a hands-on training to deconstruct the advertisement and analyse the various visual components in the advertisement, specifically on the ads brought by them from their counties. Session 3: Dr. Gurinder Kaur, Centre for Research in Rural and Industrial Development, Chandigarh built familiarity with the process of conducting Focus Group Discussion (FGD) and In-depth Interviews (IDI) required for the study. She explained the participants the various steps involved in doing FGD with the employees of Advertising Companies and women working in the advertising sector. She briefed about the qualitative approach and its strengths and weakness. She also spoke on the cultural aspect of research and emphasized that each country will have to take into cognizance their own customs and social practices before starting data collection. Session 4: During this joint session, Prof. J. Jethwaney introduced the idea and process of making a multi-media tool-kit after the findings of baseline study have been collected. She cited the example of the multimedia kit made for a project earlier. Such tools will emerge as a handy tool and would give relevant information of any participating country just on a click of a button. 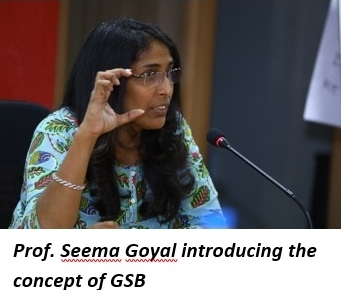 Prof. Seema Goyal introduced the concept of Gender Sensitive Barometer (GSB). She added that the GSB would act as benchmark and would be eventually turned in to an application. This will be useful in monitoring the gender sensitiveness prevalent in different media organizations across south Asia. The last day of the training concluded with the valedictory function at the IIMC New Delhi. In the valedictory session Prof. Murthy expressed his happiness over the successful completion of the workshop. Prof. S.K. Goyal also thanked the participants for their keen interest in learning and taking the project further in their respective countries. He said ISID will continue to play an active role in similar workshops and added that the accommodation and facilities of ISID would always be available. Shri K.G. Suresh, DG IIMC expressed his gratitude and assured that IIMC will continue to play an active role in research and Communication. He quoted that IIMC offers a course for Developing Countries and the Institute would be happy to have participants from other south Asian countries as well. Prof. Veena Sikri thanked UNESCO, IIMC and ISID for being partners in this baseline study. She also thanked the various delegates from different countries for participating in this workshop. She encouraged the participants to contribute actively in this research so that the findings could be shared with different media organizations. Prof. J. Jethwaney acknowledged UNESCO for helping in this baseline study and thanked Prof. Murthy and Prof. S.K. Goyal for their constant support in organizing this training workshop. She accredited the participating teams for their efforts in participating in this workshop. analyze field data sent from various countries. Almost all (both who have received some grant form UNESCO and others who have not) requested for funds to carry out the baseline work further. The valedictory concluded with distribution of Certificate of participation by Shri K.G. Suresh, Mr Al Amin Yusuph, Prof. Murthy, Prof. S.K. Goyal and Prof. Jethwaney to different delegates from participating countries. 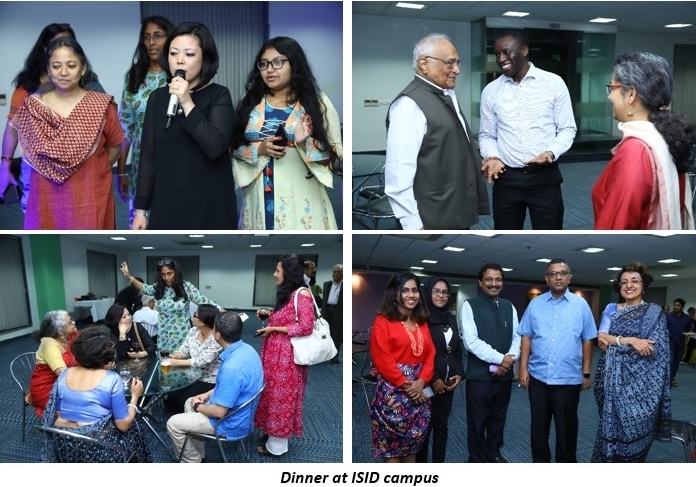 This was followed by a farewell dinner hosted by ISID at their campus.